Funding has been granted for a pioneering new research programme involving electrical brain stimulation combined with robotic training which could significantly speed up and improve recovery for victims of stroke. The Faculty of Health Sciences at the University of Southampton is calling for volunteers affected by loss of arm and hand function through stroke to take part in a unique training regime for an hour a day, every day for six weeks after they return home from hospital. The study is believed to be the first in the world combining transcranial Direct Current Stimulation (tDCS) with rehabilitation robots, for the hand and arm and will take three years to complete. If the treatment proves to be as successful as expected, it is intended that a version of the tDCS machine will be developed for use at home, providing a better recovery outcome for patients and significant cost savings for the NHS. Welsh company Magstim Limited, which developed and manufactured the electrical brain stimulator to be used in the study, is planning to develop the home-use device. 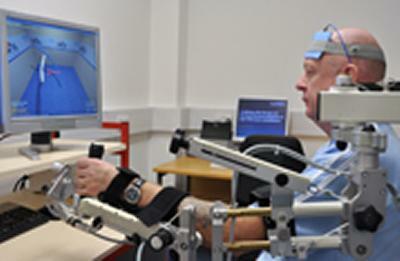 Funded by Wessex Medical Trust, the research forms part of the Faculty’s Rehabilitation and Health Technologies Research Group, part of a larger programme of research into the use of robots in rehabilitation of the hand and arm. The research team includes a group of control engineers led by Professor Eric Rogers and Dr Chris Freeman, expert researchers in electronics and computer sciences. The Rehabilitation and Health Technologies Research Group is also undertaking basic science research to understand how the human brain can be made more ‘excitable’ through the use of tDCS. It is thought that this reignites the damaged part of the brain, better preparing it to form new connections when undergoing robotic training. The research team from across the University will be led by Professor of Restorative Neuroscience, Jane Burridge, of the Faculty of Heath Sciences, with support from Dr Ann-Marie Hughes and a PhD student grant-funded by the Maltese Government. The research team will also be working with Hocoma, the Swiss medical technology company, and robot’s originator, to further develop the technology to include electrical stimulation for the hand and with John Rothwell, Professor of Human Neurophysiology at the Institute of Neurology, University College London. The robot element of the research is UK Government funded through the Engineering and Physical Sciences Research Council (EPSRC). The University is looking to recruit local volunteer patients with a view to commencing the programme in six months’ time. If anyone is interested in taking part they should contact Professor Jane Burridge at the Faculty of Health Sciences on +44 (0)23 8059 8885, or email jhb1@soton.ac.uk.